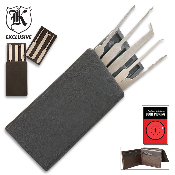 We now offer the most unique lock pick set ever! It is an actual mini lock pick set inside what appears to be a credit card! At 1/8" thick, it is about twice as thick as a normal credit card. The back slides off to reveal 4 individual picks and a double-sided tension tool. The picks are solid stamped stainless steel and will give you hundreds of uses. This set fits in your wallet perfectly so that you can have it with you wherever you go. Also includes The Guide to Lock Picking book.